At what altitude will a bag of chips explode? 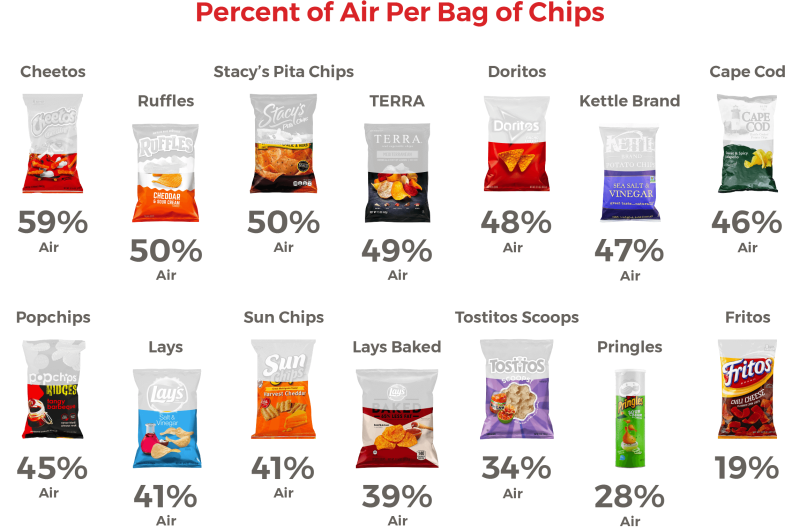 Are chips sold in Denver and New Orleans manufactured at different altitudes? What would happen to a bag of chips on a submarine? These questions keep me up at night. I should Google them. We talked about the explosion thing on our last vacation! My son got some chips for the plane and when we went to open them after we took off, they looked like they were about to explode. I don’t know how much higher we’d have had to go to get some action, but cruising altitude wasn’t quite enough to make anything go haywire. In regards to your comment about viruses: I have a rare autoimmunde disease (called CIDP) that attacks the myelin coating on some nerves. It is pretty well accepted that having the flu, or getting a flu shot, can trigger the disease in some cases. In my case, I developed it a few days after getting a flu shot. I went to a talk by a doctor who was studying the disease, and he put up a slide showing the chemical structure of myelin, and the chemical structure of the flu virus (or maybe just a portion of the virus – I can’t quite remember). They were remarkably similar. So the idea is that the body’s immune system gears up to fight the flu virus, gets a little confused, and attacks the myelin instead. I think that as we learn more, we discover that some of these pathogens have more of an impact than we realized. For example: the discovery that most ulcers are caused by a bacterium, and not by eating spicy food. Interesting! Sounds similar to what they found with the celiac thing. The H Pylori thing is a great example. Still not clear why that took so long to be accepted. That’s a very good question. I think that part of the problem is that medical doctors are generally not scientists, and don’t think like scientists. It was easy and seemed rational to latch onto spicy foods and stress as the cause of ulcers, but there did not seem to be any interest in getting experimental confirmation. I’m particularly miserable about the whole thing because I’ve caught a terrible cold, which does not play well with the heat/humidity. My daily dose consists of garlic and hot peppers.Hot peppers are especially good for treatment of symptoms- clearing sinuses. Garlic makes the hot pepper more palatable. At the same time, exposure to a lot of people increases the probability of colds, as my cousin living in lower Manhattan can testify. Prior to a September visit to Texas, she got a cold, which was aggravated by the airplane AC, my cousin told me. When visiting my father in August in a Boston area hospital, I got a cold. Hospital AC recycling cold viruses? While eating at an Italian restaurant, I could barely breathe. The moment I stepped out into fresh air, I could breathe again. I suspected “dirty” AC filters at the restaurant. For your next career you might consider “science writer.” In your wide reading, notice which females get credibility and how. Complete switch from cheetos to pringles now. I do recall a Head Start study which showed that the bullies and the victims did worse, while the average kids did a teeny bit better, for a net negative for the program.